Diameters run between 1/8” & 5/32” and average at about 9/64” (+/- 1/64”). We also have a wide variety of brightly colored paracord now available, please check them out by clicking here! This supplier's certified and calibrated laboratory's policy is one of continuous product improvement and development. Constant monitoring and testing of incoming raw materials, in-process manufacturing inspections, and final product specification testing assure that all components meet and often surpass government standards. For those of you who have no idea what paracord is (and I didn't up until a year or two ago), it's like the duct tape of the fiber world. Paracord is nylon rope that was originally used in parachutes in World War II, which is where the name came from (originally it was parachute cord). Now it is a versatile utility cording that is still used extensively in the military, but is also gaining in popularity for personal use. Military-grade paracord is so useful that it deserves a Spin so those without military connections can learn about and make use of this great material. 1) Bracelets, belts, and lanyards: Braiding objects with paracord that you have on you all the time is a great way to keep a little safety around your waist or wrist. If needed, say to tie down a load on the roof of your car, all you need to do is unweave the bracelet and voila! You are ready for the task at hand! This is especially useful for camping and hiking, where you can wear some safety on you so it doesn't take up room in your pack. 2) Dog collars and leashes: You can braid great custom dog leashes and collars out of paracord; paracord's strength and rot-resistance make it ideal for this purpose. 3) A saw: That's right! By pulling on a length of paracord fast enough to create actionable friction, you can saw some things in half, such as two-inch wide tubular webbing! Check out this brief video from Estela Wilderness Education, LLC for a demonstration. 4) Catching food: Paracord is so versatile it can be used to catch animal food, big or small. You can cut a length of paracord and remove one of the internal two-ply threads for use as fishing line, or use the in-tact cord for animal snares and traps. 5) Useful thread: The internal threads are also thin enough to sew on loose buttons or torn seams in clothing or tents, and even as dental floss. 6) Camp construction and utility: In any sort of camping situation (intended or not) paracord has too many uses to mention. Because of its strength and rot resistance, it can be used for things like pole lashing, pulling logs, hoisting food into trees for protection, and for guy strings and shelter ridge lines for tents or temporary shelters. 7) Making fire: Since paracord itself is nylon it won't burn for you but it does catch heat so it can be used as tinder to light larger pieces of kindling. And, you can use paracord as the necessary string in a bow-drill, a very basic and primitive way to make fire if needed. Here's information on making and using a bow drill from Nature Skills. 8) Medical emergencies: In the unfortunate instance that you get hurt while camping or hiking, paracord can literally save your life or the life of a friend. It can be used as a tourniquet, a sling, or to lash splints together on a broken limb. You can even string the paracord between two sapling trunks to make a stretcher of sorts. 9) Automobile fix: No, really! You can take 550 paracord and use it as a temporary replacement for something like a fan belt. Just be sure to knot the cord every few inches, otherwise the slippery nature of the cord will cause it to slip off. 10) Rappelling: No, paracord is not great as a regular climbing rope, but in an emergency situation you can rappel or otherwise haul your body weight with 550 paracord (provided you don't weight more than 550 pounds). 11) Woven items: With enough skill you can weave things from paracord such as water bottle holders, fishing nets, bird nets, or other traps. 12) Pulley systems: Around the house or in the woods, having a good block and tackle pulley system can allow you to haul and lift weights much heavier than you could without pulley assistance; paracord is great in pulleys. 13) Weaving rope: If paracord isn't strong enough for you, you can use it to braid even stronger rope for hauling or pulley purposes, such as to remove a stuck vehicle. This is an option if you are in a situation where you don't have proper rope available. Have you ever wanted to use paracord as shoe and/or boot laces? Now is your chance! 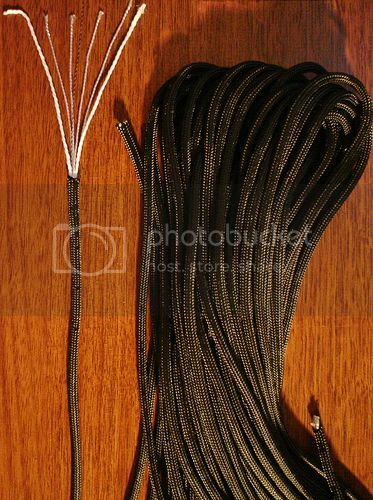 We have for sale 45"`and 54" inch laces made of paracord! Check it out here. Nylon itself holds up well in UV. The colorants add an extra element of UV inhibitors as well. All of these factors add up to a U.V. resistant cord, however everything will eventually break down in the sunlight. Colors fade and strength is ultimately reduced when exposed to direct sunlight. This is true with all fibers, however nylon does hold up a bit better than others. This paracord is ideal for camping, boating, crabbing, indoor or outdoor clothesline, halyard line, garden line & any other uses requiring great strength & durability. Contains Seven (7) Removable Inner Strands that can be used for fishing line, sewing thread, tripwire, nets, traps and other emergency +/or survival situations. Paracord is a lightweight nylon kernmantle rope originally used in the suspension lines of US parachutes during World War II. Once in the field, paratroopers found this cord useful for many other tasks. It is now used as a general purpose utility cord by both military personnel and civilians. This versatile cord was even used by astronauts during STS-82, the second Space Shuttle mission to repair the Hubble Space Telescope. The braided sheath has a high number of interwoven strands for its size, giving it a relatively smooth texture. The all nylon construction makes paracord fairly elastic; depending on the application this can be either an asset or a liability. Mil Spec 550 Para Cord is made to Mil-C-5040 specifications (7-strand core). This para cord is trusted and used by our armed forces. Military grade 550 paracord rope known as Mil-C-5040 Type 3 is made of nylon so that is dries quickly and is mildew resistant. It is 1/8 inch in diameter and is rated for 550 lbs. "We sell you (& have always sold you) 550 Paracord which is the commercial version of the mil-spec Mil-C-5040 cord. Your 100’ & 50’ coil label refers to it as “military style”- which is a common description, but can be mis-interpreted. We also make the mil-spec cord & make it to the military spec & sell most of that to the military. However, some of it is also sold in the commercial market. It also tests 550 lbs, but is made from more expensive yarns & therefore is a higher priced item. When we are selling either, we always clearly label it either 550 Cord or Mil-C-5040 Cord. My brothers and I are in different branches of the military and find various uses for paracord, from having extra as a bracelet to out in the field. This is by far some of the best paracord I have come across as well as inexpensive. I will be buying more in the future. We recently asked our fans on Facbook about their favorite uses for paracord and we received a wide variety of responses. You can tell from the chart that it can be used for almost anything, in survival, camping, and every day use. Many people said that it was impossible to name just one of their favorite uses for it, as it comes in handy in so many situations. A lot of our fans seemed to indicate that they never leave home without at least a little bit of paracord! Can you think of even more uses that isn't listed on our chart? Why not become a fan of Camping Survival on our Facebook page!